After a successful winter season for Middle School sports, including a perfect 14-0 record for the boys' basketball "A" team and a near-perfect 10-1 season for the "B" team, spring sports are officially underway. It promises to be an exciting season for our Middle School teams, as students develop new skills, refine existing ones and gain valuable experience through competition. 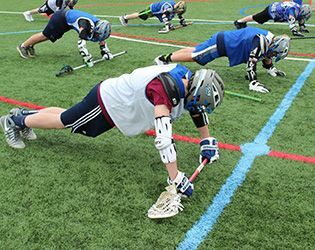 Among the most popular Middle School sports this spring are lacrosse, with over 70 students participating, followed closely by track & field, with 60. The sports of baseball, softball and boys' tennis remain popular, with student interest divided fairly evenly among them. The Middle School season officially opened the first week of April and will run through mid-May. Each spring, one of the biggest highlights is GSB's own Silver Spike Invitational; this year, the event is scheduled for Wednesday, May 4. We hope you will come out and see some of our Middle School teams this season!